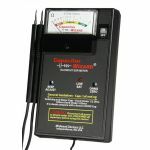 Midwest Devices Capacitor Wizard is an extremely fast and reliable device designed to measure ESR (Equivalent Series Resistance) on capacitors of 1uf and larger "IN CIRCUIT" eliminating the need to remove the capacitor for accurate tests. The Capacitor Wizard finds BAD caps IN CIRCUIT or out of the circuit!! Purchase Midwest Device Products from Howard Electronics Today!